I originally believed that my relative, Stanley Musgrove, was a member of the crew of a Halifax which was shot down over Belgium on 27 / 28th April 1944. I now know it was another Stan Musgrove but this is a small tribute which records the events of that night and the aftermarth. 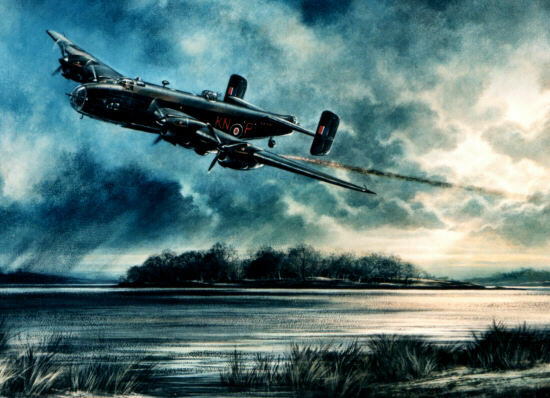 A four engine Halifax bomber from 432 Squadron took off from East Moor, a RCAF base just north of York, at 23:36 hrs on 27 - 28 April 1944 to bomb railway yards at Montzen in Belgium. There was a standard seven man crew on board. It seems that flying above the flak at 11,000 feet, the bomb run was completed successfully and the plane was returning to England. There was a sudden burst of flak from a railway train which hit in a number of places, setting the plane on fire. The pilot feathered the burning engines and ordered everyone to bail out at about 01:30. The plane crashed near Hanneche (Limbburg) a small village 2 km west of Burdinne in Belgium. PILOT - F/S. Gilbert Millar RCAF; 20 years old - second youngest member of the crew - was a clerk from Brooklyn, New York City before the war. In his Report he said "after bombing, we were hit by Ack Ack shell (reported to have been by a woman AA gunner) and set on fire. I ordered my crew to bail out and followed myself at approximately 400 feet." He parachuted near Pintails in Belgium and hid in a small wood overnight before being contacted by locals who passed him on to the resistance. Eventually he, like all the others on the run, were liberated by the advancing Americans who flew him back to England. I have recently contacted and communicated with Gilbert's sister who lives in Texas. FLIGHT ENGINEER - Sgt. Stan Musgrove RAF; 25 years old - I don't know how or at what point Stan was captured but he ended up as a POW at Kopernikus, Stalag Camp 357. I need to visit the National Archives to find if he completed his Liberation report (WO 208 3348 to 3352. There is a card index of names in the Research Enquiries room but it is not comprehensive). The files consist of Evaders who were captured and POW Escapers reports from all war zones. About 60% of returnees completed the liberation questionaire. NAVIGATOR - F/O. Peter Holmes RCAF; 21 years old - was wounded badly in both legs with flak and was attended to in Belgium by a young doctor in a small village, Villers le Bouillet, in Eastern Belgium. He was the only survivor who believed everyone in the crew, except FLATHER, had been killed. Peter was previously a life assurance student from St John's, Newfoundland, before the War. BOMB AIMER - Sgt. Duncan McCaulay RCAF; 26 years old - from Nova Scotia. He said that they had "bombed our objective. On return journey we were hit by flak and forced to bail out." He landed in trees, got rid of his parachute and hid for two days in some nearby woods. The Belgium Maquis located him and took him to a farm where he was sheltered for five months by a Belgium family. RADIO OPERATOR - Sgt. Warren McPherson RCAF; 25 years old - his Report says that his "wounded arm was giving trouble and my feet were very blistered." TOP TURRET GUNNER - Sgt. George Flather RAF; 30 years old - after parachuting from the plane he landed near Fize Fontaine, Belgium and rested in a haystack for two days until he approached and obtained food and civilian clothes from a local farmhouse. He stayed in the village a couple of weeks before being moved to Liege. TAIL GUNNER - Sgt. 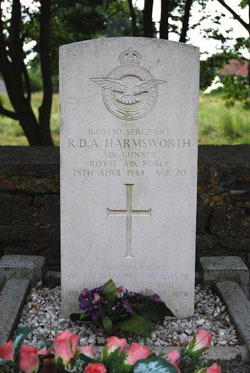 Roy Harmsworth RAF; only just 20 years old - the only fatality of the raid. Roy is buried in a cemetery of the Church of Hanneche in Belgium. Comment : It is difficult, sitting here at the beginning of the 21st century, to comprehend the fear which must have gone through their minds as their plane caught fire at over 10,000 feet and they descended by parachute into enemy territory. Hardly suprising those returning were reluctant to talk about their experiences afterwards.